Here is the lastest twist on the Nigerian email scam. Several writers have received an email from one “Martin Sanders” who claims to be representing Shoot Rajasthan Film (a legitimate film production company, by the way). Phil (dogglebe) received one such email and posted it to the discussion forums. The email contains a fake message from Shoot Rajasthan Film to Mr. Sanders purportedly asking Mr. Sanders to secure the rights to a particular script. Mr. Sanders then sends out an email informing you, the writer, that he and only he can represent your script for the mere sum of $300. Tick, tock. The October OWC closes in three hours (11:49 pm eastern daylight time). The scripts are trickling in. On another note, I reposted the August OWC selected scripts Our Time Deserves A Love Song. The wrong audio file was being presented on iTunes. So for those of you subscribed to the SimplyScripts podcast feed, the correct file should now be there. If you use iTunes, you can subscribe to the SimplyScripts podcast feed by clicking on this link. Repost of the August OWC selectee. As you all know, in August we had the August One Week Challenge wherein participants were asked to write a 12 page romantic drama/comedy script based on a piece of music. We had 37 entries. The fine folks over at iScript.com were kind enough to select one script out of the group to be recorded. The selected script is Our Time Deserves A Love Song by Marnie Mitchell Lister (wannabe) . Additional thanks to The Drabble Cast for providing the melody upon which the challenge was based. 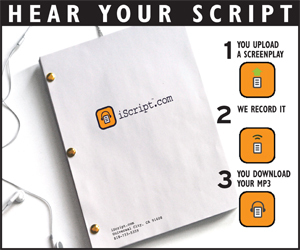 You must write a script (properly formatted) 12 pages or less (courier 12 point font). As you all know, in August we had the August One Week Challenge wherein participants were asked to write a 12 page romantic drama/comedy script based on this piece of music. We had 37 entries. The fine folks over at iScript.com were kind enough to select one script out of the group to be recorded. Michael Cornetto’s web series has finally premiered, Computer Girl an electronic girl trying to find my way through life’s biological problems. First up: Computer Girl loses her virginity. You can read the script (pdf format).